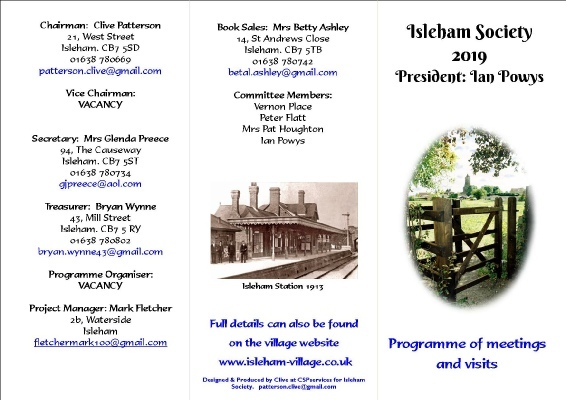 What is the Isleham Society? The society is a group of friends interested in our village, it's history, traditions, it's preservation and development. 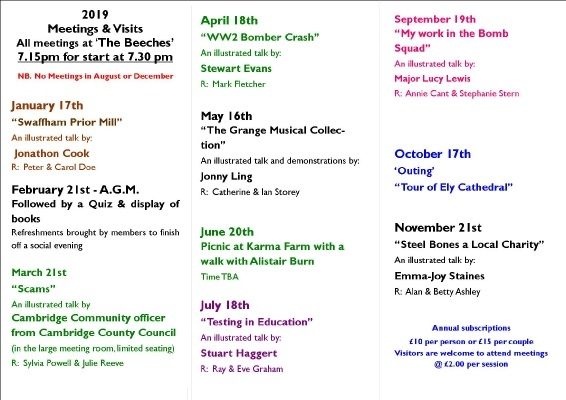 in the The Beeches community centre meetings are at 7.15 for a 7.30 start. All members are welcome and visitors are also encouraged. There is nearly always a Guest Speaker. Subjects range widely, often with special emphasis on topics of local or general East Anglian interest. The society also organises one or two outings during the year usually in the Spring and the Autumn. Though primarily a group of Isleham residents, the Society welcomes members from all over. It will flourish for as long as sufficient residents and friends of Isleham – young as well as old – continue to care about all aspects of our village and become active Members. 1. This Competition is open to residents of the Parish of Isleham aged 12 years or over. 3. There are two entry routes to this Competition as follow: by email to patterson.clive@gmail.com. Entries must be labelled with the entrant’ name and location of the photograph and image files must be a minimum of 200 dpi and between 0.3MB and 20MB. Larger files are preferred to ensure the print quality. Entrants should include their own name, address and telephone number & email; We regret that we are unable to accept postal entries. 6. Copyright in all images submitted for this Competition remains with the respective entrants. However, in consideration of their providing the Competition, each entrant grants a worldwide, irrevocable, perpetual licence to The Isleham Informer & The Isleham Society to feature any or all of the submitted images in any of their publications, their websites and/or in any promotional material connected to this competition. 7. Maximum of 8 entries per person. Late, illegible, incomplete, defaced or corrupt entries will not be accepted. No responsibility can be accepted for lost entries and proof of transmission will not be accepted as proof of receipt. Entries must not be sent through agencies or third parties. 8. The winning entries will be that that is judged to be the most visually appealing, original and self-explanatory. The winner will be notified within twenty one days of the closing date of the competition. 9. One entrant shall win a copy of the calendar. They may also have their name published. 11. Events may occur that render the Competition itself or the awarding of the prizes impossible due to reasons beyond the control of the Promoter and accordingly the promoter may at its absolute discretion vary or amend the Competition and the entrant agrees that no liability shall attach to the Promoter as a result thereof. 12. The Promoter is responsible for the first part of the promotion, which is the publication and adjudication of the competition. 13. English law applies and the exclusive jurisdiction of the English Courts shall prevail. Promoter The Isleham Society.